Students of The Washington School of Ballet in Septime Webre's The Nutcracker. Photo by Stephen Baranovics (2009). I’ve always thought of The Nutcracker as the gateway drug for ballet. It hooks you when you’re young, all candy confection and delicacy, with just enough undercurrent of budding sensuality and danger to appeal. Once smitten by the Sugar Plum Fairy and her tasty treats, it’s only a matter of time before The Red Shoes are dancing you unwillingly to the train tracks, or the Black Swan is bewitching you to your doom. Okay, that’s a bit much! But I was reared on the filmed version of Baryshnikov’s magical American Ballet Theatre production, before I knew the sad backstory of Gelsey Kirkland, before my beloved ballet teacher damned my dreams of being a baby ballerina with the exasperated sigh, “She simply has no turnout.” I can still hum Tchaikovsky’s score almost in entirety. So yes, even a lovely children’s dream ballet like The Nutcracker can bring me to tears. Septime Webre’s version for the Washington Ballet and its school, playing at the Warner Theater now through December 26, is a local holiday tradition that I experienced for the first time this year. The audience was a mix of nostalgic adults like me, and children brought to experience that heady gateway drug. 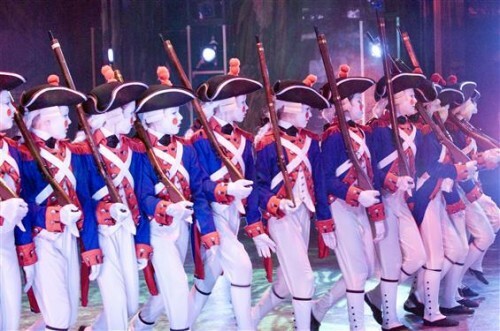 The visual aspect of the production is perfect – the traditional story of Clara and her Nutcracker Prince, their battle against the wicked Rat King and their trip to the fairy kingdom, lovingly portrayed against the backdrop of Victorian Washington with relatively uncomplicated choreography well executed by a multigenerational cast of talented dancers. It’s a great introduction to the joys of ballet. Except for one flaw. A flaw that breaks my heart, for what is says about the future of live performance and an art form that struggles to survive in economic distress. I know that the practical reason the Washington Ballet is dancing The Nutcracker to a taped score is financial hardship. Does this truly negatively impact the audience’s enjoyment, particularly that of children? Sitting in the glorious Warner Theater, I cringed every time the sound quality or volume wavered. Writing in the Washington Post, Sarah Kaufman called it “goopy” for the Sugar Plum Fairy’s famous solo – she’s absolutely right, and more. The essential joy of that solo was marred by the recording, despite the beautiful footwork of Maki Onuki. It should be a flirtation between dancer and orchestra for the audience. The final moments of the ballet, with Clara’s return home matched to the exquisite ending of the score, should pound in your heart. Just raising the volume on the recording doesn’t do that. There are still delights here, certainly. The dancers exude joy and fun. The clever production design matches traditional characters with Washington counterparts – the Nutcracker squares off against the Rat King as George Washington and King George III, Arabian dancers become Anacostia Indians (hands down my favorite section, sensually well done by Sona Kharatian and Tamas Krizsa), and of course the appearance of our iconic cherry blossoms. The student dancers are not only absolutely adorable, but completely committed, no small feat for young performers. Their performances are certain to inspire other children to take class. Set in a gorgeous theater with lovely sets and costumes, danced by a great company, in every other aspect but sound this is a top notch production. Someone needs to come forward and underwrite the costs for a live orchestra for next year. This is the perfect opportunity for a corporation to show some local love. In the meantime, bring your little aspiring dancers and get them hooked. Washington and its ballet deserve it. Septime Webre’s The Nutcracker is performed by the Washington Ballet at the Warner Theater now through December 26. Located at 1299 Pennsylvania Avenue NW, Washington DC 20004. Closest Metro stop: Metro Center (Red/Orange/Blue lines). For more information call 202.362.3606 x605. I disagree totally. It’s an aweful interpretation of the Nutcracker and takes all of the fun of the original storyline. That’s why this year we’ll be seeing the Moscow Ballet’s version at the Strathmore instead. Gateway drug indeed. Liam is hooked. We went Sunday afternoon – he sat on the edge of his seat the entire time and “shooshed” a little girl sitting nearby who talked a bit too much for his liking. I found most of the Washington adaptations charming (and I went in highly skeptical that departures from tradition would irritate the heck out of me) and agree that the Anacostia Indian adaptation was fabulous. The lack of a live orchestra was disappointing, but I don’t think it lessened the gateway drug aspect for Liam one bit.